Properties in Orleans Parish average 4.7 out of 5 stars. Property 2: NEAR STREETCAR LINE! NEW LOCATION!! BOOK NOW! 5 minutes from FRENCH QUARTER! Property 3: Hop On The Streetcar ! Property 6: Live Like A Local In Historic Architecture! Property 9: Charming Creole Caribbean in Mid City! Property 10: New Orleans Home w/Patio - 2 Mi to French Quarter! Property 15: Good for families or longer visits. Property 19: Uptown Cottage 2/2 - Steps to St. Charles Ave.
Property 22: Whole House- One Block To Frenchmen Street - With Courtyard! 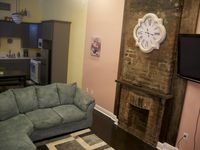 Property 23: Irish Channel Home Only 10 Mins to French Quarter! Property 26: 1839 Victorian Private Large Room Sleeps two Garden District. Property 28: RELAX IN BEAUTY & GRACE BEHIND THE GREEN DOOR! Property 36: Classic New Orleans home centrally located minutes to anywhere in the city! Property 37: This is it!! A great place for a group get-together! Property 39: Big Easy Charmer 2 Bdrm 19STR-00985 In Convenient Location. Property 44: LAST CHANCE FOR JAZZ FEST!!! GREAT RATES AND LOCATION!!! Property 45: New Orleans Home w/Hot Tub-1 Mi to French Quarter! Lake Catherine Camp House with fishing pier, private launch, & sandy beach area! Property 47: Lake Catherine Camp House with fishing pier, private launch, & sandy beach area!